Sophomore Torri Sayman fell to the ground after missing the final penalty kick that would have tied the game against Brookhaven. With the miss, the Harvesters lost 3-2 and their season ended. There was not a dry eye on the Eastfield sideline. 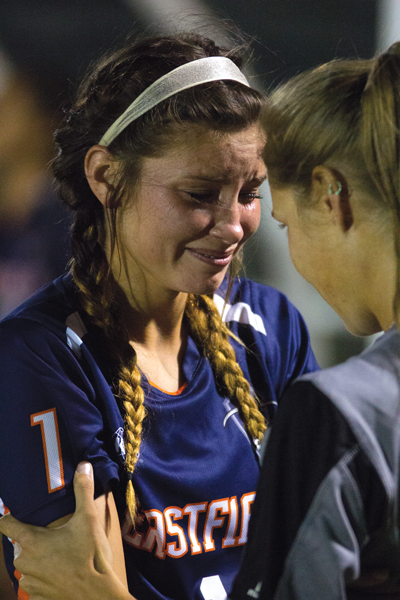 The jarring pain of last season’s loss against Richland in the conference tournament final returned to the surface. This time it was in the semi-final of the Metro Athletic Conference tournament. Although she said she was heartbroken, defender Sayman said she was proud of the team’s performance against Brookhaven. The teams where scoreless through regular play and after 20 minutes of overtime, so they went to penalty kicks. The first team to score 3-out-of-5 penalty kicks wins. Eastfield had Karla Corchado, Yessenia Calvillo, Emily Juarez, Elizabeth Cobar and Sayman kick. Calvillo and Juarez found the back of the net, but the others missed. As Sayman approached the ball to line up her penalty kick, the score was 3-2 with Brookhaven ahead. She had to make it to keep the game alive. She kicked and missed and immediately fell to the ground. It was her last play for the Harvesters. She will graduate in December. The Harvesters finished 14-6-1 overall and 7-4 in conference. Eastfield played a tight game against Brookhaven. Corchado said she was disappointed in herself for missing her penalty kick and failing to block the three by Brookhaven, but is motivated to come back next year and get better. In the second half of the game, captain Karla Gutierrez went down with an ankle injury and had to be helped off the field. She did not return to the game. Sophomore midfielder Cobar said she could feel the difference in the team once Gutierrez left the game. We updated the story with the correct record. Thank you.